AMAZING. I'm in awe of all of your skills! So, so impressive. Wow that's really good with the chandelier! So accurate! Thanks both of you! I actually revamped it a bit to make it more like the one on the set. I'll post pics after the dining room is finished. A lot of flies, a lot of mud...a lot of everything in there. If I were you, I'd stay out of there! 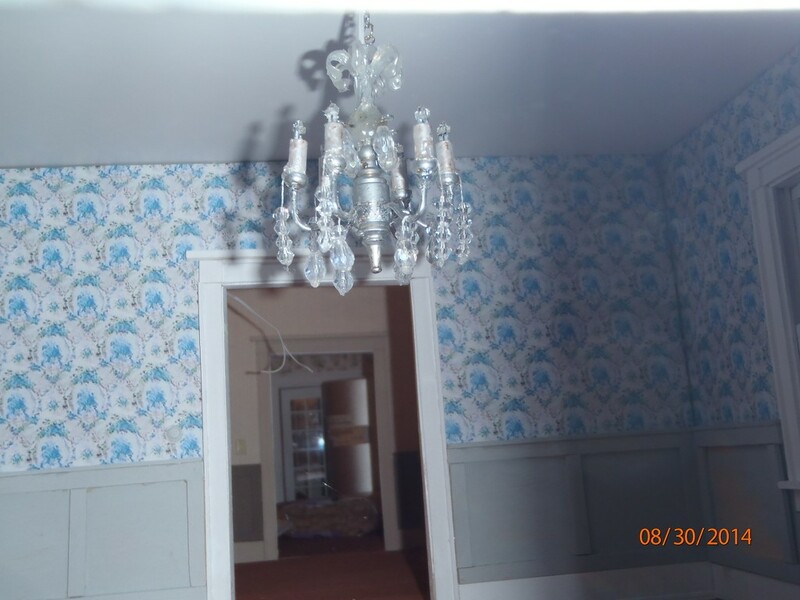 First pic, the chandelier on the 1979 set in the dining room. This is the finished product in the dining room of my house. Dining room still isnt finished but is very close. What I have so far.. 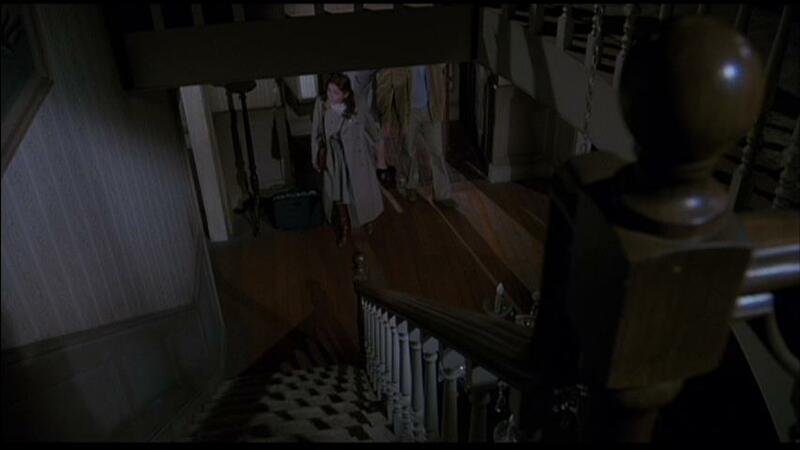 The staircase is still sitting freely and still isnt glued into place. 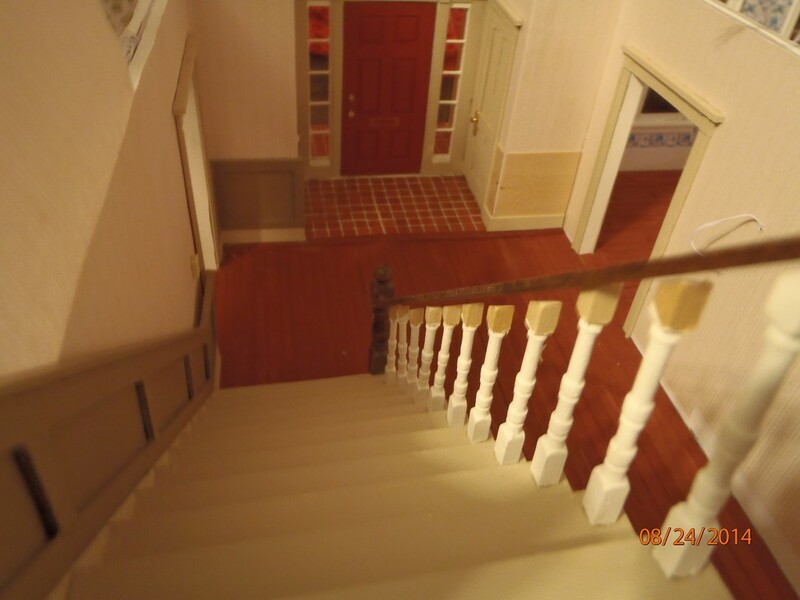 Banister is just resting on the balusters and not glued. 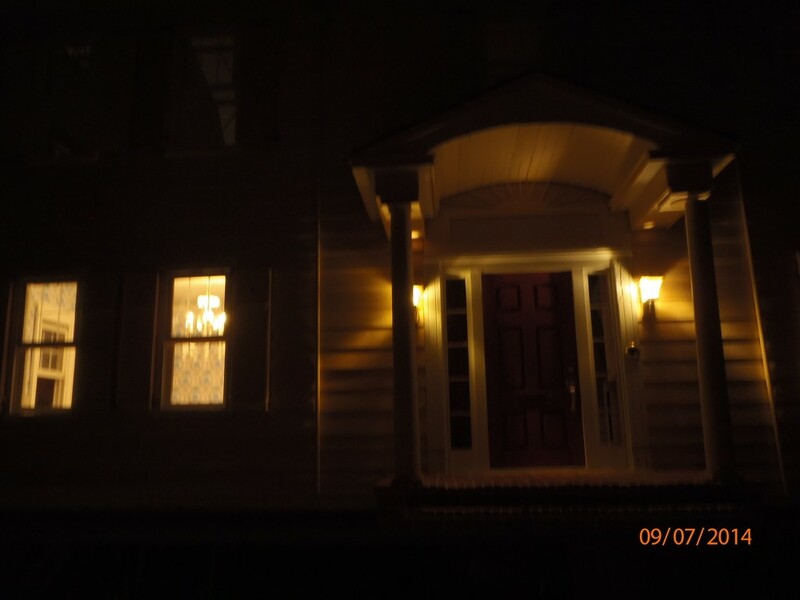 Still have to finished painting the balusters and re seat them on the steps. Looks strange around the front door doesnt it? 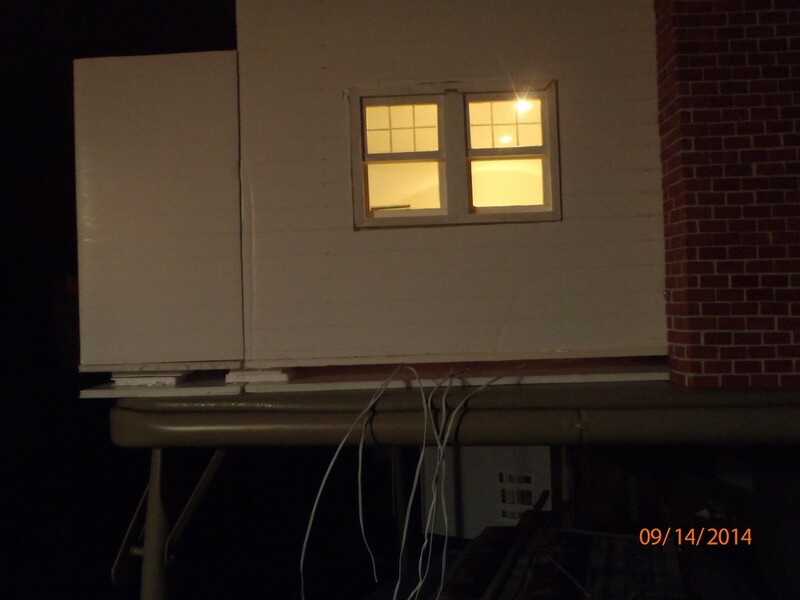 I needed to remove the canopy and front landing to access under the house from the front and the only way to do that was to remove the front landing. Had to remove them anyway so they can be removed with ease to make the house fit through a door. So after all that and making tabs to put on and take off the landing and canopy, its all back in place with no glue. After that I also installed pins to hold the shutters in place. They would never say still when any kind of wind blows past them. Well, of course everything looks awesome... it looks great. 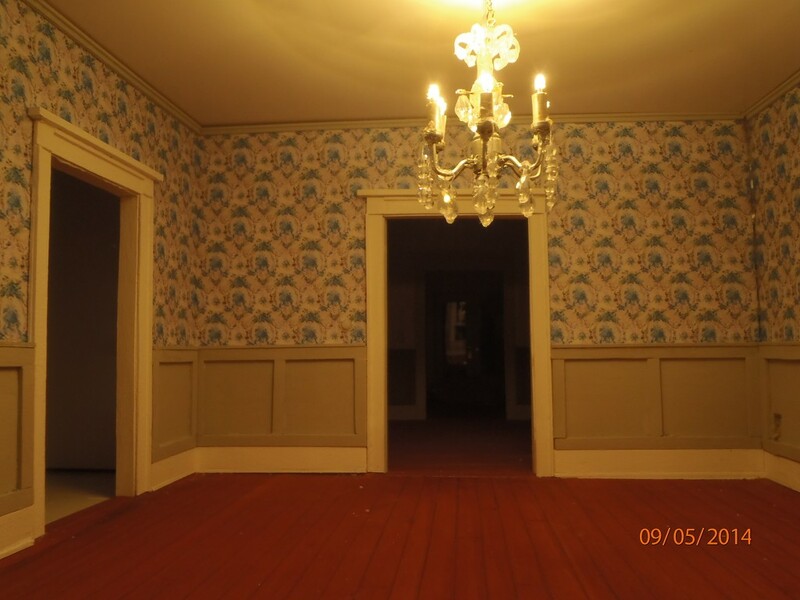 Is the wallpaper in the dining room is from any of the movies? I still wish I could make one like yours! antny000 wrote: Well, of course everything looks awesome... it looks great. 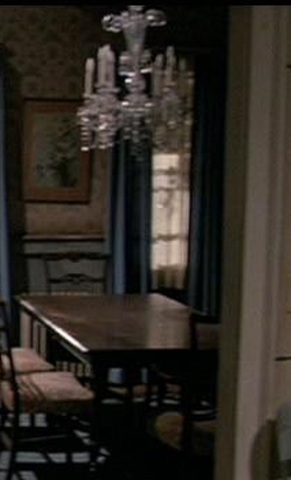 Is the wallpaper in the dining room is from any of the movies? Yes. 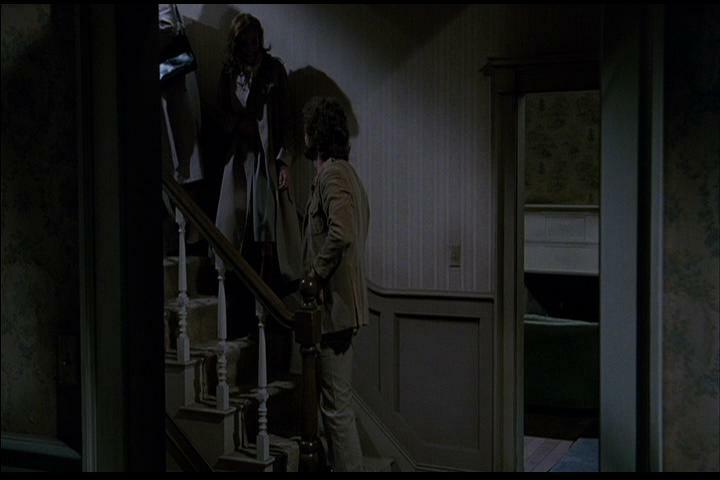 Its a clone from the 1st movie edited just as I did with the foyer and living room. Dining room is finished! It is the 2nd room in the house that has no more work to be done. Its even been vacuumed. Yes the inside will be accessible from the back. 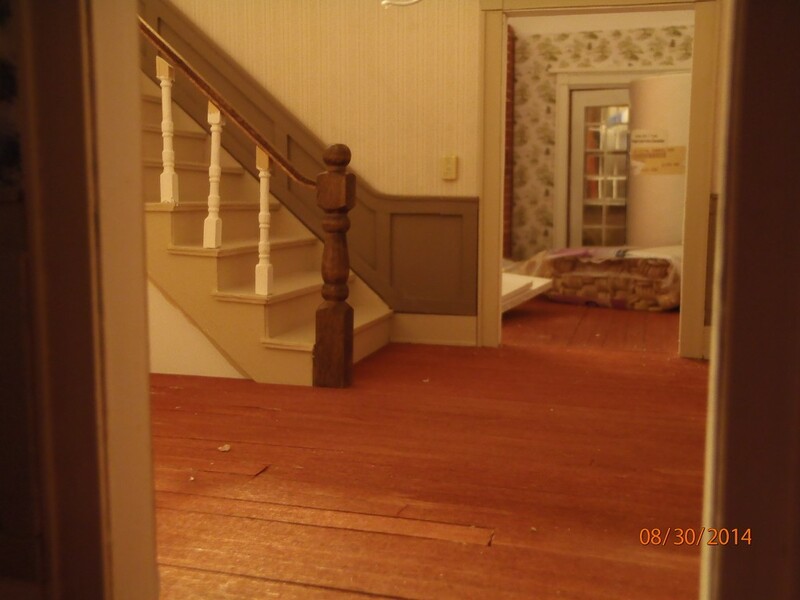 Some rooms such as the dining room and a couple bedrooms on the 2nd level wont be so easy to access other than through the doorway. 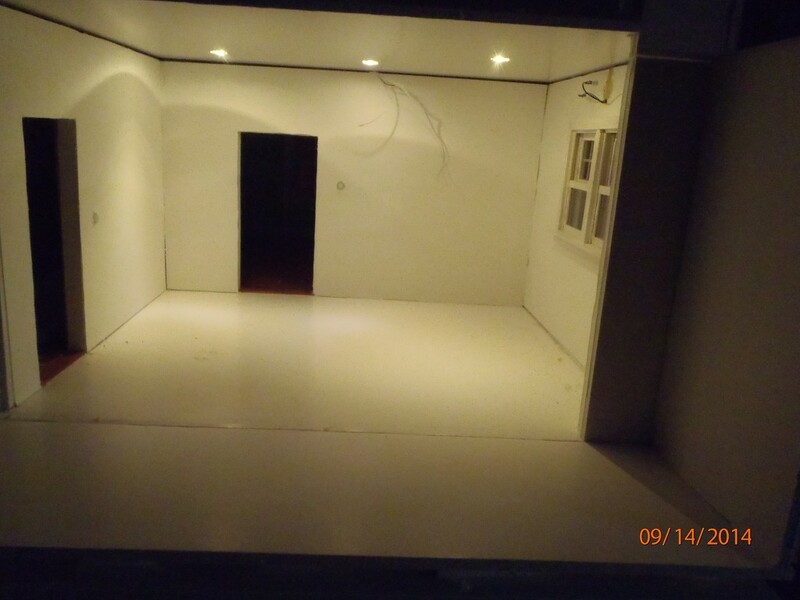 The last house I did opened up from the back and the floors were removable. 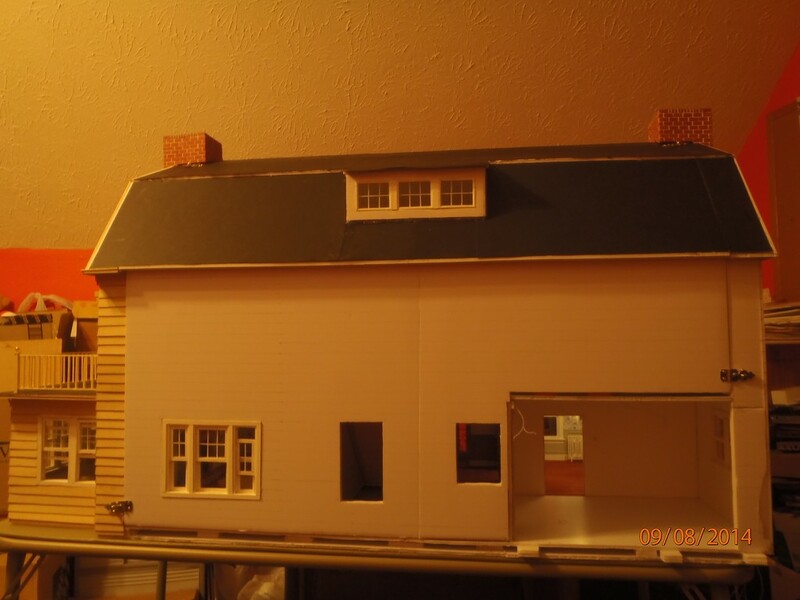 At least thats how it would have been if completed although didnt make the house very sturdy. 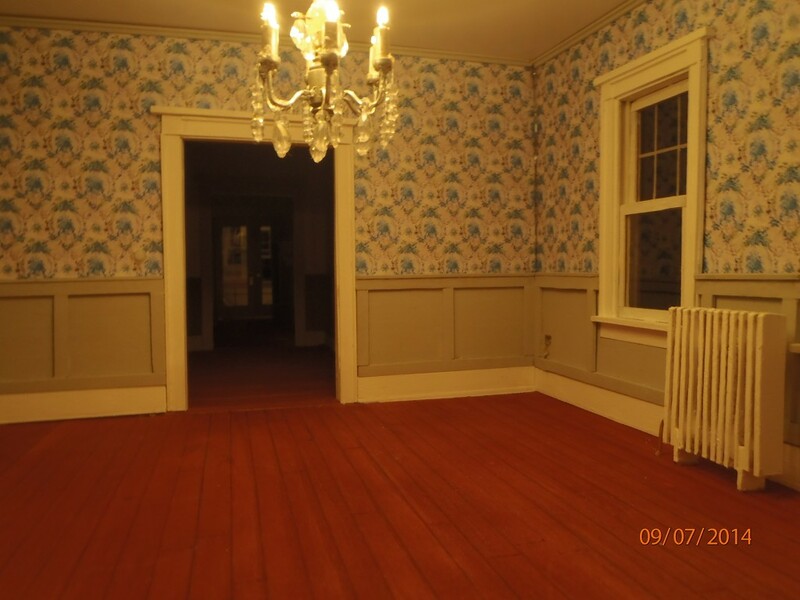 This house, the floors will be permanent and double layered. the first layer will go in as sections as I started over the kitchen and dining room. The next will go over the foyer then the next in the livingroom. I'll layout all the canister lights and wiring then overlap it all with 2 whole sheets of foam board to complete the floor. This house is pretty solid now even with the back off. Will take a lot to tear this one down! Here is with the back open as it is most of the time. And with the back on and latched. There are 4 latches...2 on the roof and 2 on the sides. The tabs you see sticking out by the kitchen will be part of the kitchen addon/balcony/backdoor. This will allow that section to be removed when needed and for access. 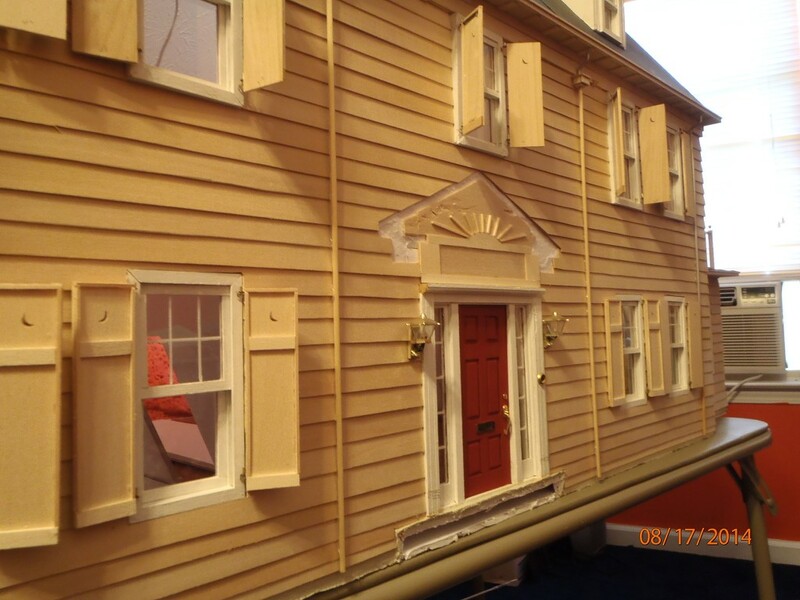 I did around the front door the same way so now the landing and canopy holds tightly against the house without glue. 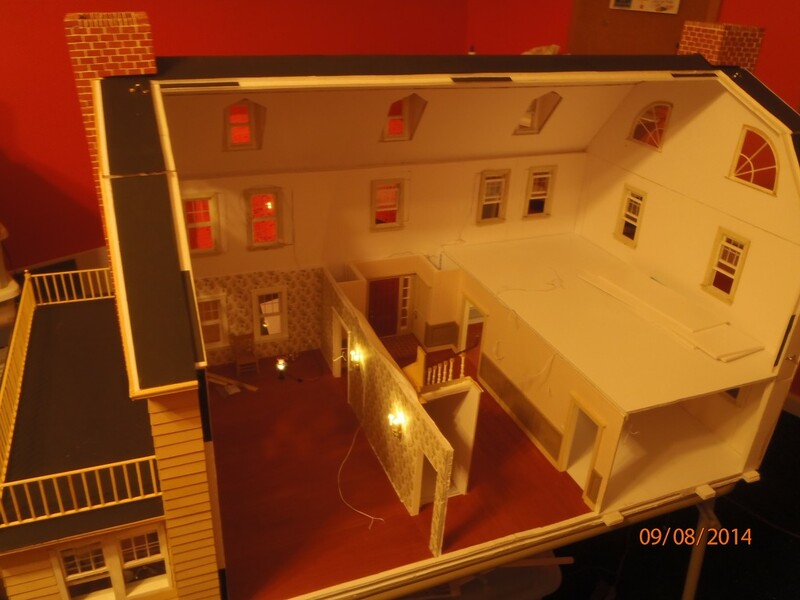 I wish I had done something like that when I built mine, made parts removable... though my house was already completely assembled, except for the base, which is removable ad will definitely have to come off whenever we move out of our apartment. antny000 wrote: I wish I had done something like that when I built mine, made parts removable... though my house was already completely assembled, except for the base, which is removable ad will definitely have to come off whenever we move out of our apartment. Yes that's why I planned ahead this time. 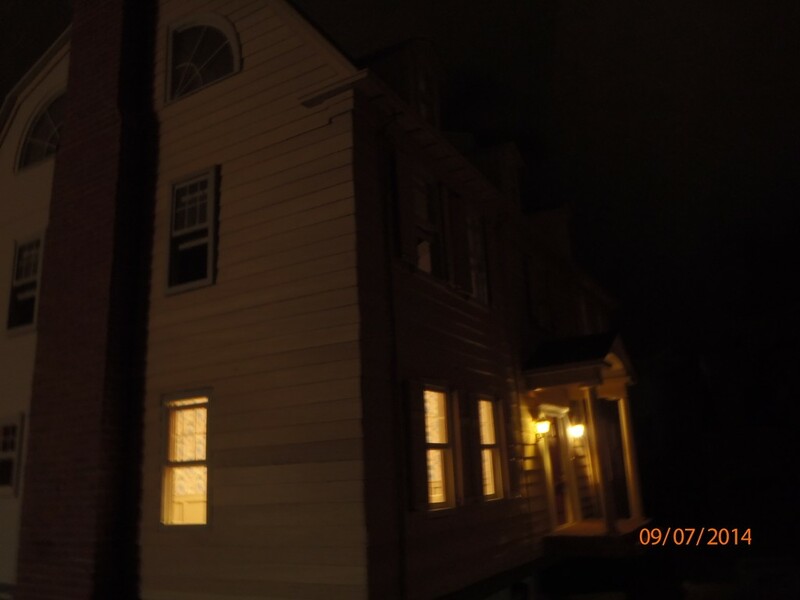 The front door landing and canopy was permanently attached to this house when I built it then realized it needed to be removed if the house had to be moved out of the room or even shipped if I do for sure decide to sell it. So I modified that issue. Never too late to modify things. That's cool you saved the pics. I have more in my album than I actually post. After you posted that about looking to see how far its come, I looked back on this thread from the beginning and WOW! yes its come a long way! Everything I said I was going to do then has been done as of now. This house has been built so much better than the last ones I've done. Heck I wouldnt mind. Doing this takes the real life stress away. I wouldnt know what to do next after this gets done. May do a real house version but thats still up in the air. I would either have to hit the lottery or save up for a long time... your house has probably already cost you quite a bit and it's not done so I can only imagine what the final cost would be. I've been keeping a total on my current dollhouse so I know how much I've spent so far and how much I'll spend in total when it's finished. 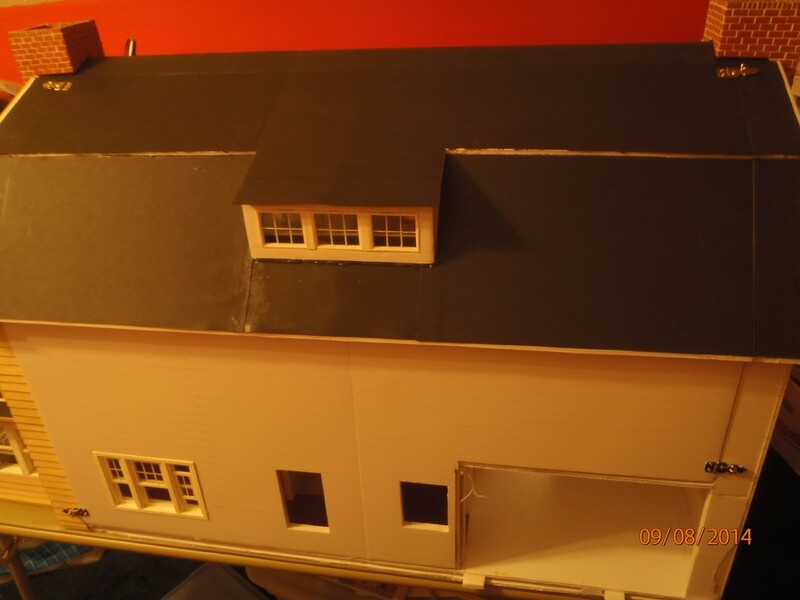 The exterior is almost done, the back needs some more shingles and then the shingles need to be painted black, which I plan on doing tomorrow. 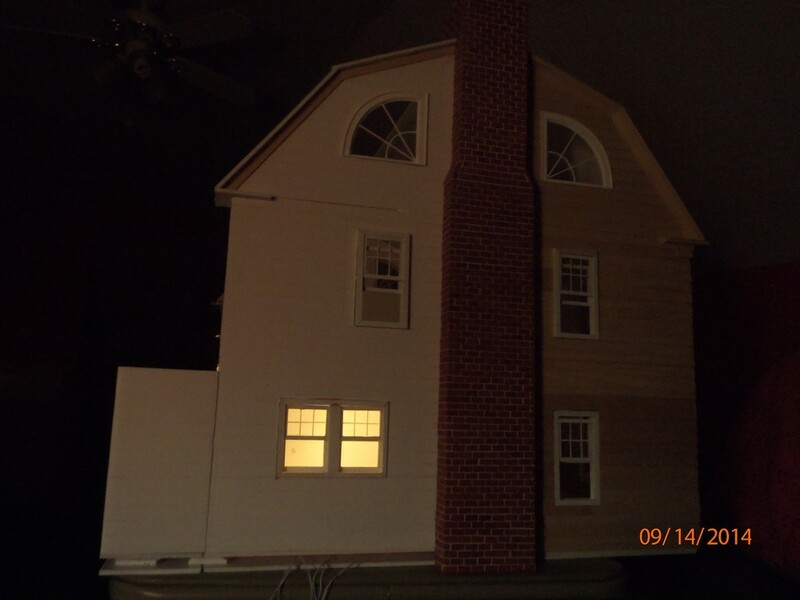 We have an A/C unit in our living room in the wall, below our picture window, so on the exterior of the dollhouse, I created the unit sticking out of the wall. I couldn't make the interior because there's not enough room between the window sill and baseboard to fit, but it looks pretty good on the outside! After the shingles, I just need to add hedges and electric/ meters. After that I can start focusing on the inside again. I'll probably work my way through the house beginning with the smallest work to the most, the bathroom only needs a few small things, so I'll probably do that room first. Then the dining room because it's 80% furnished already. Wow, that looks absolutely stunning! Can't wait to see the finished product. antny000 wrote: I would either have to hit the lottery or save up for a long time... your house has probably already cost you quite a bit and it's not done so I can only imagine what the final cost would be. I lost count back in January I think it was. Then it was closing in to $1000. Chichibcc wrote: Wow, that looks absolutely stunning! Can't wait to see the finished product. Thank you! It'll take a while before it's finished so I can't wait either. lol Feel free to check back once in a while for updates. I think once it is done, I may do a video tour of the entire house. So this is what I've been working on this weekend here and there. 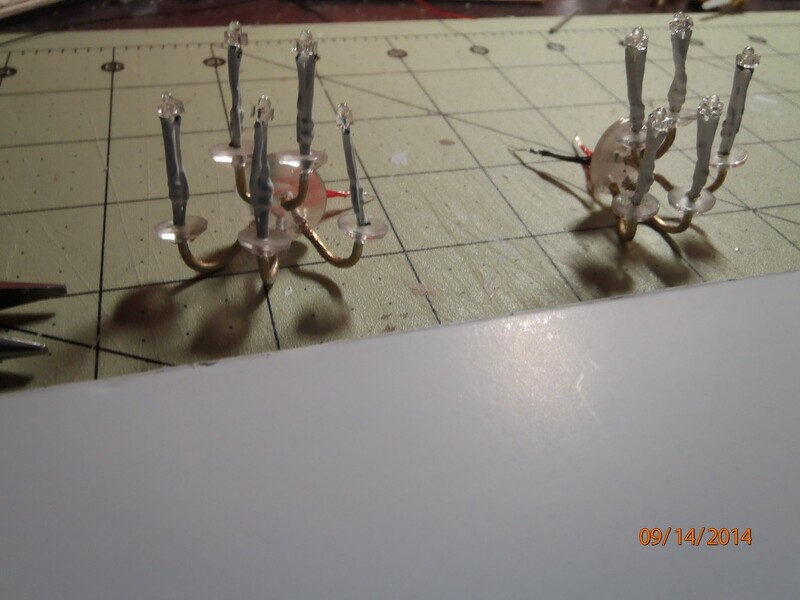 Started working on the wall sconces for the foyer. Both are done for the first floor. Only thing left is the crystals that go on them. Kitchen is also on the works. Lights are now on for the kitchen. This is where all the wires for the entire house come out at. 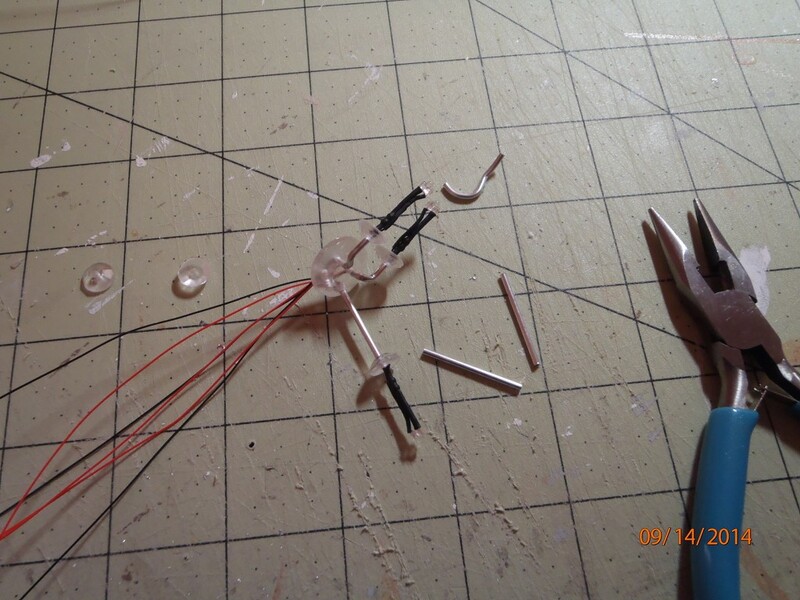 This is one main reason why I left this corner unfinished until I knew for sure I was done with running all the wires. Now that they are done and once I finish the addon for the kitchen, I can finish the rest of the house on the outside. Kitchen. Looks bright and modern but modern is my intention for the kitchen, bathrooms and a few bedrooms. 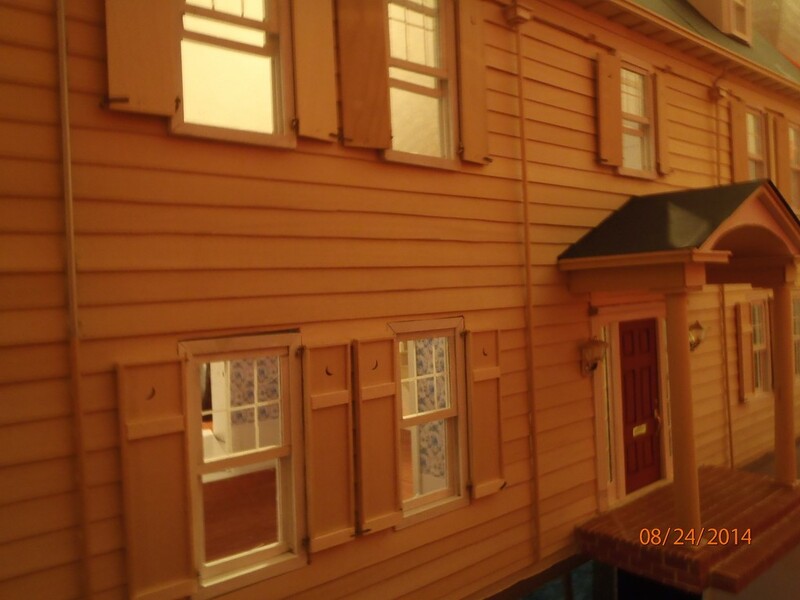 And when you finish this one, I think you should definitely do a real-life version of the house as you were thinking about. Brooke Forrester wrote: Looking good! Thank you Brooke! I'm really thinking about it. In the meantime, I'm coming up with more ideas with this one and blending some of the old style interior of the real house on Ocean Ave. with this one...just in the bedrooms. 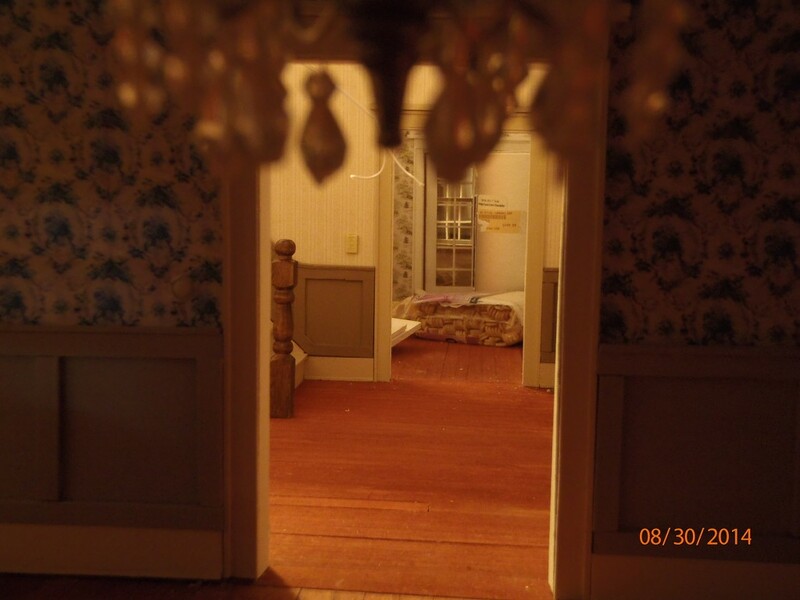 I'm working on using the wallpaper of Allisons room and using it in the room where "Amy" slept in the movie (rather than just paint it). The master bedroom will have the mirrored wall (already have the mirror tiles for it) and on the 3rd floor, it will have 2 rooms and a bathroom. 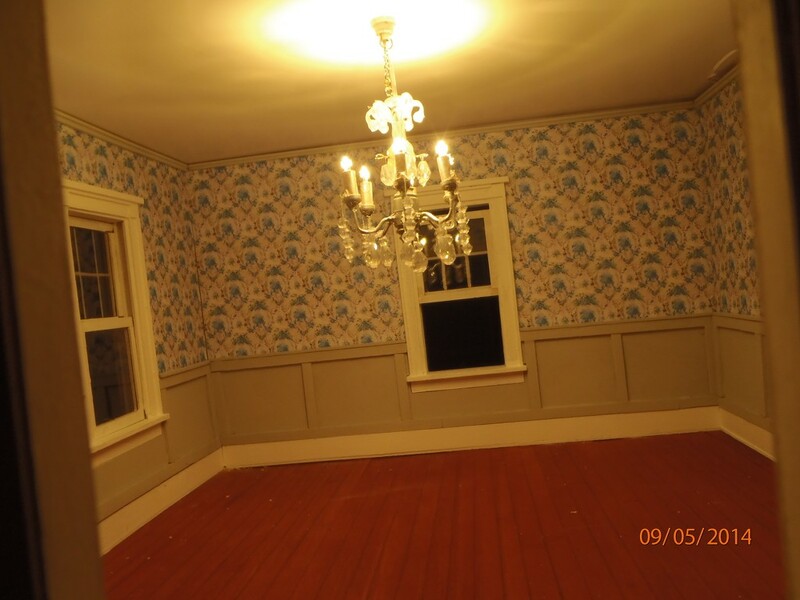 One of those rooms I'll be working on using the wallpaper from Dawns room and THAT will be interesting to do. 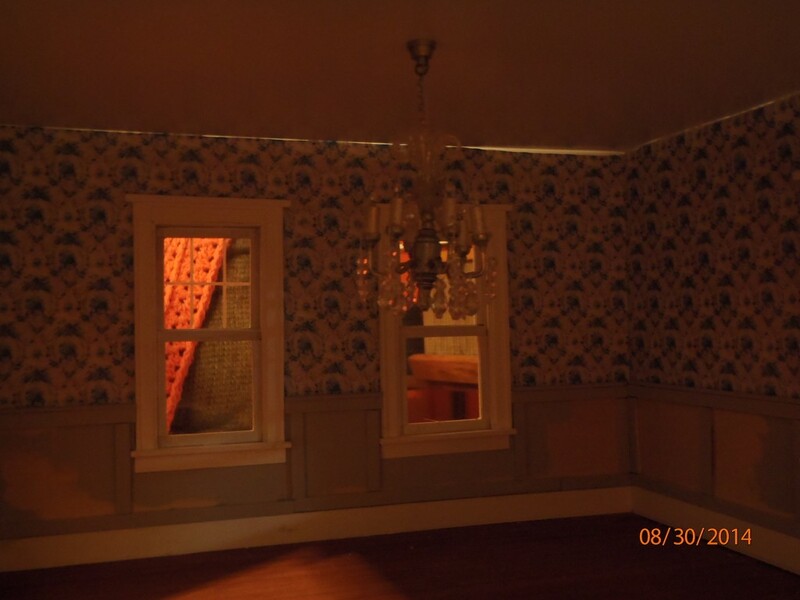 Cant clone the wallpaper in Dawns room because of the reflection I need but will have to copy the pattern. As for Allisons room, that will be completely cloned as I have done with the rest of the house so far. All that sounds really great! 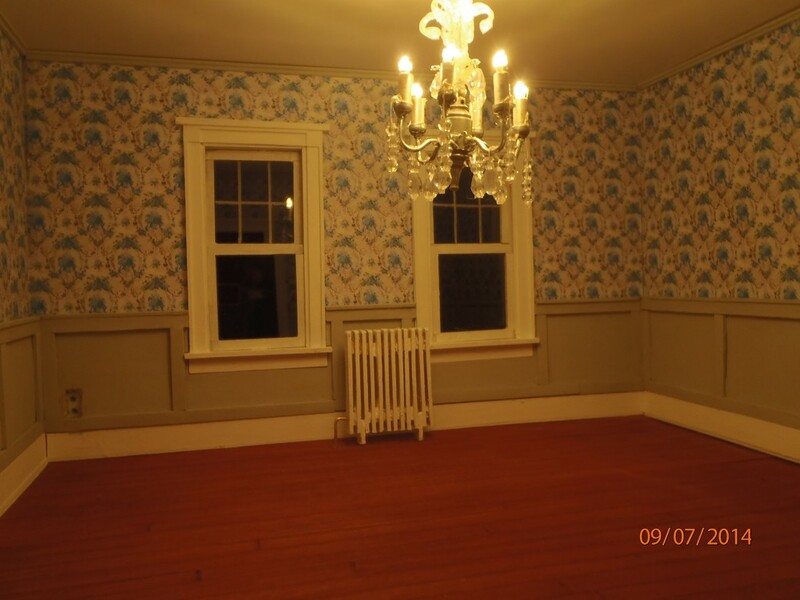 I especially love the wallpaper in Dawn's room, that will be interesting to see how it comes out for your house.